Head to The Ranch on Friday, February 22nd for one of the most celebrated musical events of the year! Battle of the Bands returns for an electrifying evening of live music and dancing. Proceeds from this fundraiser support KICX 106 & 104.1 The DOCK’s Radio for Cardiology, Kempenfelt Rotary Club and the MacLaren Art Centre. Help raise money while rocking out to the impressive musical talents of local financial and medical professionals. 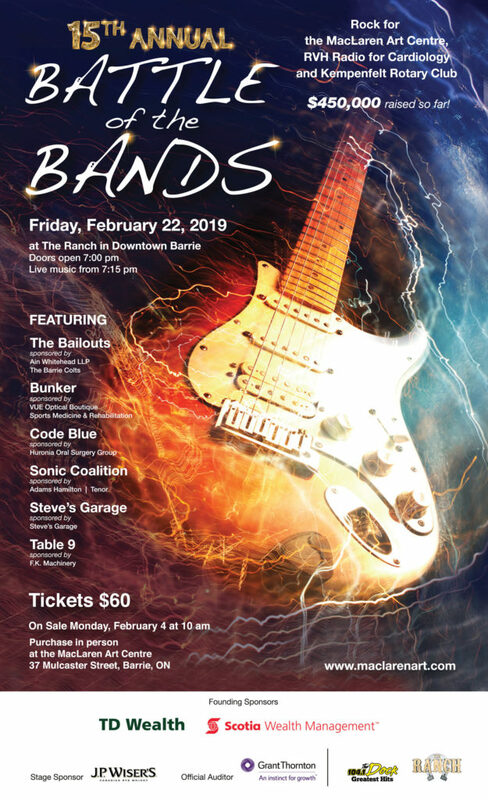 Our 2019 lineup features The Bailouts, Bunker, Code Blue, Sonic Coalition, Steve’s Garage and Table Nine. Doors open at 7:00 pm. Live music begins at 7:15 pm. Catering by Cravings Fine Food Market & Catering. Tickets $60, available online and at the MacLaren beginning February 4 at 10 am. Organized by the MacLaren Art Centre. Click here for more details! Sponsored by TD Wealth, Scotia Wealth Management, Grant Thornton, J.P. Wiser’s, 104.1 The DOCK and The Ranch.